Sudhir Agarwal is the Founder and Chief Executive Officer of Sunrise. He is also the Chief Executive Officer of Everise and the Chief Experience Leader at C3/CustomerContactChannels, where he brings more than two decades of corporate leadership and management experience to the company. His areas of expertise include operations, migrations, client management, business development and corporate mergers. 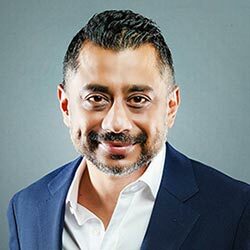 At Everise, Sudhir is responsible for leading and expanding the business operations throughout Singapore and across Asia to realize its vision to create a USD 500 million Experience Company in the BPO Industry. Through C3, Everise operates twelve customer experience centres across the U.S., the Philippines and Latin America, with over 10,000 employees providing multilingual support to clients ranging from major global multinational companies to local firms. Ever a believer in technology and its disruptive yet beneficial effects, Sudhir partnered Everise with Microsoft in 2018 to develop an Artificial Intelligence (AI) platform to disrupt the Contact Center and Business Process Outsourcing (BPO) industry. In addition, he led the Company to a Joint Venture with UBASE, Korea’s largest BPO to form Globee, a multilingual centre in Malaysia that is powered by native language speakers. Globee is a Global Business Services Center providing omnichannel customer service solutions that targets voice, video and text interactions in multiple languages, and delivering an unprecedented intelligent, customer-centric experience by leveraging the power of AI. Prior to forming Sunrise, Sudhir was a founding member of Aegis, one of the largest BPO companies in India. Growing the company from its humble beginnings with a mere five-employee operation, Sudhir grew the business across India, Sri Lanka, South Africa, Europe, the Middle East and Asia. Before founding Aegis, Sudhir joined Genpact in 1999, where he held multiple leadership roles spanning across operations and transition management. He also spearheaded the company’s successful foray into Hungary and China. In August of 2018, Sudhir was awarded the prestigious “CEO of the Year Award” by Asia’s Outsourcing Excellence Awards presented by CMO Asia, in addition to the Best Outsourcing Provider and BPO Innovation of the Year awards presented to Everise. Sudhir has a Bachelor’s Degree in Commerce from Delhi University and a Master of Business Administration from Manchester Business School, UK.